Three-dimensional printing has come a long way. Compared with its rigid, unpliable forebears, the Sneakerbot II by Recreus is flexible—so flexible, in fact, that you can crumple it into a fist-sized ball for stowing away until you need it. 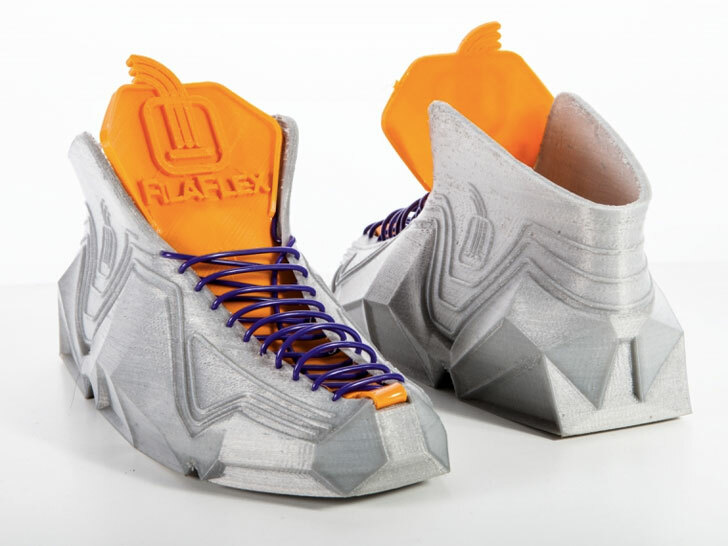 Designed by Ignacio Garcia—and inspired by such ’80s sci-fi films as Back to the Future and Short Circuit—the shoe owes its malleability to a combination of plant-based PLA and Filaflex, an elastic filament developed by Recreus to retain its springiness even after it’s melted and extruded through a machine. The design, which is free to download, offers the “perfect balance of support and comfort,” says Garcia. Of course the Sneakerbot doesn’t appear to be the most breathable of shoe. (The foot environ is bound to get uncomfortably moist.) Still, it does suggest that print-on-demand kicks will be a reality sooner rather than later. Take that, Zappos overnight shipping. Three-dimensional printing has come a long way. Compared with its rigid, unpliable forebears, the Sneakerbot II by Recreus is flexible�so flexible, in fact, that you can crumple it into a fist-sized ball for stowing away until you need it. Designed by Ignacio Garcia�and inspired by such '80s sci-fi films as Back to the Future and Short Circuit�the shoe owes its malleability to a combination of plant-based PLA and Filaflex, an elastic filament developed by Recreus to retain its springiness even after it's melted and extruded through a machine.